Telescope selection can at first glance be complex, we hope the information below will help you decide which telescope is best for your needs. WYAS is here to help you any way we can in making a decision on what is best for you. 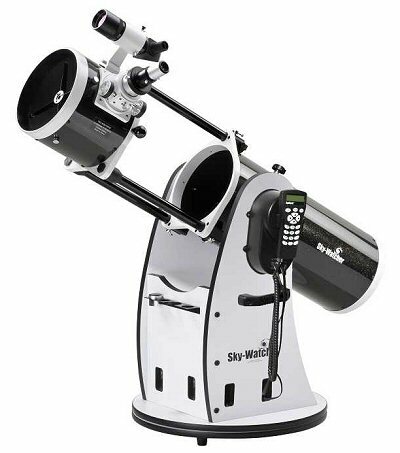 We have all the types of telescope at our observatory and are happy for you to use them and get some experience and knowledge and advise if your require it. Refractor Type Telescopes. Lens Based. Reflector Type Telescopes. Schmidt-Cassegrain and derivatives. 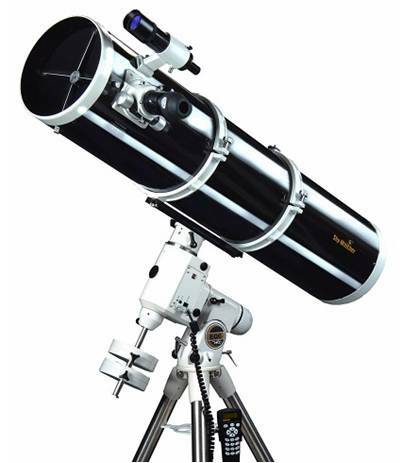 We think it is important that you have a telescope that meets your needs and requirements, we therefore suggest you consider the following questions before you decide on which telescope to buy. Answering the questions below can affect the type of telescope that is best for you. What do you most want to look at? How experienced an observer are you? What storage space do you have, and how much weight do you want to carry? All telescopes are measured in relation to the diameter of the mirror or lens. This is called the aperture. The larger the aperture the more light is gathered by the telescope making the image brighter and possibly sharper. The bigger the aperture to some degree the better the image and the telescopes magnification. However, the larger the telescope the heavier it becomes and so aperture size and weight may need to be balanced in order for you to be able to manage and use the telescope. With a 6” (150mm) telescope you should see craters on the moon and galaxies. Bear in mind that a 6” telescope gathers approx. 4x more light that a 3” (75mm) telescope does. This means the object will be much brighter in the 6” 150mm) telescope. Beware when you see telescope specifications showing 300x magnification. This may be possible BUT the resulting image quality may not be ideal and the quality may be far from what you expect to see and so perhaps you should look at this carefully and not always believe the advertising information. Does size matter and is bigger the best ? As we have said previously, the larger the telescope the more light gathering capacity it has and so any image you look at will be brighter. Large aperture telescopes of 10” (200mm) and larger are generally used for viewing what are a called “Deep Sky” objects. These are star clusters, nebulae and galaxies. Magnification is not a deciding factor in looking at these types of objects. If you are thinking of starting astrophotography, larger apertures generally reduce exposure times especially when combined with telescopes with shorter focal lengths. 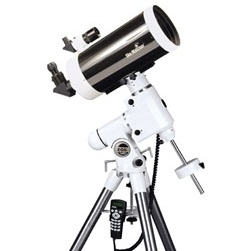 Even if you can afford a large telescope, weight and portability becomes a consideration. If you’re not capable of moving and setting up a heavy telescope, then it probably will not get used very often. However, if you have the space and can set-up a pier and permanent place for the telescope, then weight and portability may not be an issue. Regrettably, many telescopes find a permanent home in the loft or garage due to size or weight or a combination of both. In general a refractor telescope has an overall length of 8x to 12x its aperture. Refractors are generally the telescope of choice for Lunar and Planetary observation and can be light enough to be portable yet produce good images. Some refractors can be expensive if the high end lenses are made from optically perfect glass. The APO or ED designated telescopes do provide clearer images but they also cost more than the normal telescope. Again, a trade off is sometimes necessary depending on how you want to use your telescope. A 4” (100mm) telescope could vary in length between 32” (800mm) and 48” (1200mm) long making them awkward to handle and require a solid tripod for them to mount on. If you want the BIGGEST BANG for your money, then a mirror type telescope may be the best option. They generally provide good quality images of Lunar, Planetary and Deep Sky objects for a given aperture when the cost is compared with an equivalent aperture on a refractor telescope. A reflector type of telescope uses mirrors to gather and reflect the light to the eye piece for the image to be observed. One type is called a Newtonian, which was invented by Sir Isaac Newton. The main curved mirror reflects light to a secondary mirror which turns the light path through 90 degree’s to exit the telescopes optical tube assembly (OTA) at the point where the observation eye piece is mounted. Newtonian type telescopes are usually shorter in length for a given aperture when compared to refractors. A Newtonian’s compact design means a typical 8” (200mm) telescope can be as short as 4’ (1200mm) making it easy to carry and fit in most cars for transportation if needed. Newtonian based telescopes can come in sizes varying from 4" (100mm) up to 54" (1370mm). If a Newtonian is mounted on a special base and not a tri-pod, it is called a Donsonian, so called from its designer John Dobson in the 1960’s. These are renowned for their portability, low cost, and ease of use. A Schmidt-Cassegrain or Maksutov-Cassegrain telescope sits somewhere between the Refractor and the Newtonian type telescopes. This type is very compact in design and was invented in the 1930s. Using the best aspects of both the refractor and reflectors, a Schmidt-Cassegrain uses both lenses and mirrors to form an image. 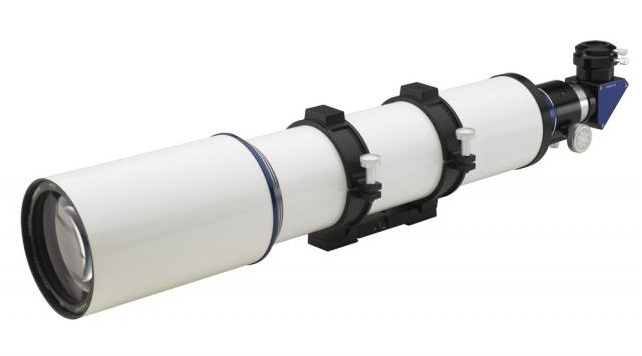 The overall length of a typical 8” (200mm) Schmidt-Cassegrain optical tube assembly is usually about 600mm long, yet the focal length of the telescope is 6’ (2000mm). This very compact design allows for high magnification imaging with a short telescope length. 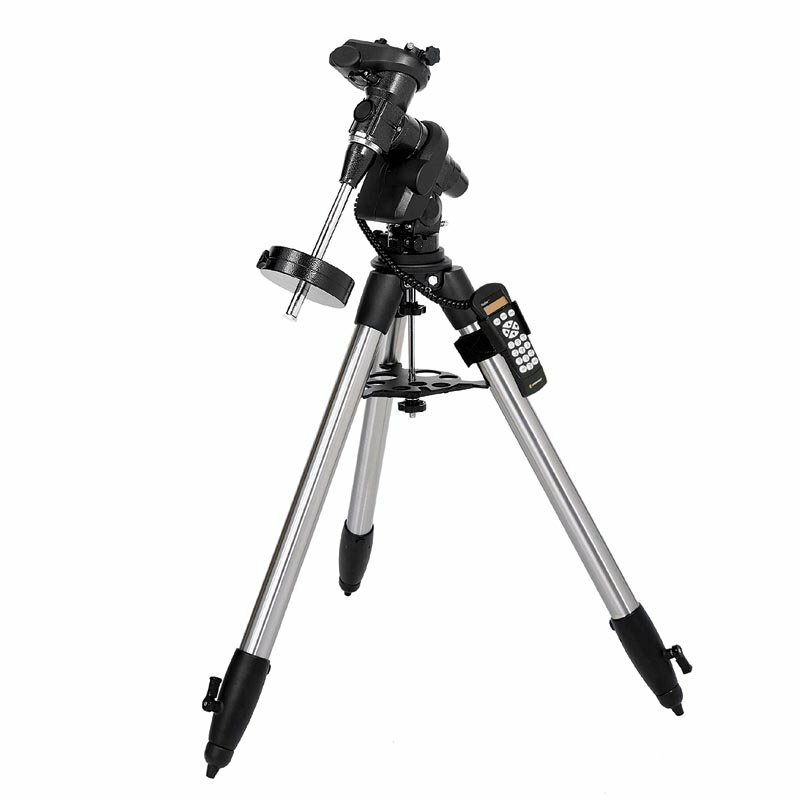 The tri-pod for this type of telescope can be lighter and more manageable making this type of telescope easy to carry and move around, yet it can have a large aperture and long focal length. Any mirror designed telescope will at some point in time require maintenance and require careful alignment of the mirrors to maintain image quality. This is known as “collimation” and can easily be done by you with the right equipment or by a telescope supplier if needed. Generally speaking, most telescope users look for ease of use, good image quality and low cost to achieve a balance of these aspects to meet their requirements. Modern telescopes can have a high degree of computerisation making them known as “GoTo” type telescopes. This means, once the telescope is set-up and what is aligned, the built in computer will automatically navigate the sky to the object you wish to view or photograph. This “GoTo” option means you do not need to have a knowledge of the stars in the sky or learn your way around the sky to find object you wish to view. 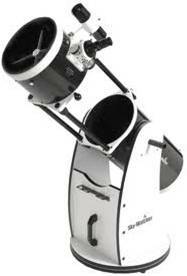 A Dobsonian mount as shown here is an alt-azimuth, or 'alt-az' type mount. The tube moves up-and-down (in altitude) and left-to-right (in azimuth). Some alt-az mounts may have electric motors fitted to allow automatic tracking of objects in the sky. An Equatorial mount is a variation of the ‘alt-az’ type mount as shown above and is mounted on a tri-pod. The EQ (equatorial) mount allows movement up-down (in altitude) and left-right (in azimuth). Equatorial mounts can also be motorized. One EQ axis is used to align the telescope North / South while the other rotates the telescope to follow the earth’s rotation. What is a "Go To" Scope ? A “GoTo” scope is one which has a computer built in. 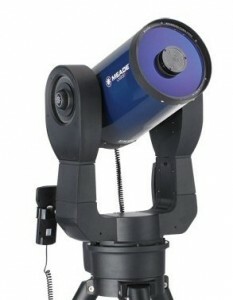 The computer plus electric drives allow the telescope to locate objects in the sky and track them for observation or astrophotography. Once set-up, a novice astronomer can view objects in the sky without the need to know his or her way around the syk and stars. “Star hoping” as it is known is the method of locating one star that is known and then you hope from star to star, a "GoTo" makes star location much easier. A cautious note. A cheap "GoTo" mount may not be as good as you think. Good quality engineering and accurate control makes a “GoTo” mount a good “GoTo” mount. Cheaper variants may not be as accurate, find the objects you want consistently and my not track as good as you wish. Price is always a factor in determining which telescope to buy. Sometimes buying the most expensive telescope is not the best option. Complexity, weight and size can relegate it to the loft or garage. However, a cheap telescope may not provide the image quality you expect or desire and again could be left unused. If either of these two options happens, you can be left uninspired and disappointed in the whole telescope affair. We recommend you look at new and also second hand equipment. Astronomers tend to look after their equipment and many play the aperture game. This is where they start small at 4” or 6” (100mm -150mm) aperture size and then graduate to 8” or 10” (200mm-250mm) aperture telescopes selling their equipment as part of their trade up process. We recommend that you investigate and take advice from reliable people who know about telescopes, their use and the positives and negatives of their types before purchase. Buying the right telescope to meet your needs is key to astronomical enjoyment. WYAS is here to help you if we can with advice, so please contact us or visit us at the observatory.